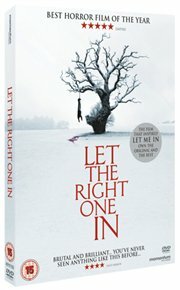 Acclaimed Swedish horror film based on the novel by John Ajvide Lindqvist, who also wrote the screenplay for the film. Acclaimed Swedish horror film based on the novel by John Ajvide Lindqvist, who also wrote the screenplay for the film. Oskar (Kare Hedebrant) is a sensitive, fragile, 12-year-old boy, living in the suburbs of Stockholm in the early 1980s, who is bullied at school and spends his nights dreaming of revenge and rehearsing knife attacks in the courtyard behind his apartment building. There he meets his new next-door neighbour Eli (Lina Leandersson), a mysterious girl of his own age who turns out to be a vampire. With Eli on his side, Oskar is finally able to face up to the bullies who have made his life such a misery, but Eli's unquenchable thirst for blood brings problems of its own. Oskar (Kare Hedebrant) is a sensitive, fragile, 12-year-old boy, living in the suburbs of Stockholm in the early 1980s, who is bullied at school and spends his nights dreaming of revenge and rehearsing knife attacks in the courtyard behind his apartment building. There he meets his new next-door neighbour Eli (Lina Leandersson), a mysterious girl of his own age who turns out to be a vampire. With Eli on his side, Oskar is finally able to face up to the bullies who have made his life such a misery, but Eli's unquenchable thirst for blood brings problems of its own.